Will declining mortgage rates reverse static home sales? Mortgage rates continued their 2-month slide, with a 30-year fixed-rate mortgage ending the year at 4.55%. 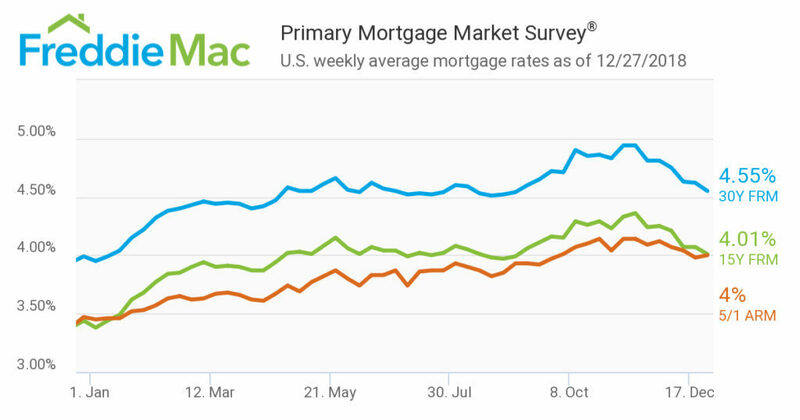 BYPATRICK KEARNS TODAY9:22 A.M.
Mortgage rates continued along their downward trend to end the year, according to the latest data from Freddie Mac released Thursday. A 30-year fixed-rate mortgage averaged 4.55 percent for the week ending December 27, 2018, down from last week when it averaged 4.62 percent. It’s still more than half a percentage point above last year’s 3.99 percent at the end of December. A 15-year fixed-rate mortgage averaged 4.01 percent, down from last week’s 4.07 percent and up from last year’s 3.44 percent over the same period. The five-year Treasury-indexed hybrid adjustable-rate mortgage averaged 4 percent, up from last week’s 3.98 percent and up from last year’s 3.47 percent. Author danswingblogPosted on December 27, 2018 Leave a comment on Will declining mortgage rates reverse static home sales? Author danswingblogPosted on December 22, 2018 December 22, 2018 Leave a comment on 5.) in conclusion, THE “WOULD JA TAKE” NEGOTIATION METHOD. 4.) THE UNEXPECTED AUCTION TRICK. This negotiation trick can arise in several ways. One method is where the seller’s listing price for a house or condo is set artificially low below the true market value. The intent of the listing agent “unethical in my opinion” and the seller is to create a “buyer frenzy” of competitive buyers out-bidding each other far above the initial asking price. Personally, I’ve seen this negotiation tactic used by home sellers who purchased back in 2004 thru 2008 for a price far below today’s market value. They were thrilled with whatever profit they receive. Another way this negotiation tactic can arise is when more than one buyer becomes intensely interested in buying a house or condo. They are told by the Realtor, “Another buyer is seriously interested in purchasing this home.” More often than not, are only fishing for a good offer. When the seller rejects the initial purchase offer, it may create competition between two or more buyers. May I suggest, if you discover you are in an unexpected auction, drop out of the bidding. If you really want to purchase the home, submit a written “backup offer” with a substantial deposit check to show your sincere purchase interest. You might be surprised when you’re told the first buyer who won the “auction” backed out and you wind up owning the home. Author danswingblogPosted on December 21, 2018 Leave a comment on 4.) THE UNEXPECTED AUCTION TRICK. 3.) LOOK OUT FOR THE FAMOUS “BAD GUY-GOOD GUY” NEGOTIATION TRICK. Everybody has seen this “bad cop-good cop” negotiation trick on TV.. More often than not, the tough cop will ruthlessly question the suspect, stopping just short of violence to gain a confession. Then the “bad” cop is called away for some reason and the “good” cop takes over to sweet-talk the suspect into a confession or a plea bargain. The same negotiation tactic works in real estate negotiations. Often the husband yet lately I’ve experienced the wife, is the “bad cop,” who is tough and not willing to compromise. But the “good cop” is the husband, who is more reasonable, don’t be fooled. This is how this tactic was used on me. I was interested in buying a “for sale by owner” house from Steve and Debbie. Surprisingly, tough Debbie was the “bad cop” demanding full price and all cash. But Steve was the “good cop” who realized the vacant house was less than perfect and would be difficult to get it sold. After a few weeks of informal Sunday afternoon open house negotiations, “bad cop” Debbie finally gave in and to my surprise agreed, to a 10 percent down payment with a 90 percent owner financing mortgage which provided comfortable retirement income for both of them for many years. I recently completed a deal like this in August, and in most cases, I suggest my sellers negotiate 30% down and finance the balance for 20 years with a 3 or 5-year balloon mortgage. With 30% down the buyers have a good amount vested into the purchase and in many cases, it covers all closing costs and puts a little bit into their pockets at closing. “Good cop” Steve was only too happy to get rid of that house. Debbie and Steve later became good friends and we completed several mutually profitable transactions together. Author danswingblogPosted on December 20, 2018 Leave a comment on 3.) LOOK OUT FOR THE FAMOUS “BAD GUY-GOOD GUY” NEGOTIATION TRICK. Please review Supportive data for this brief. Please review my December 13, and 14th blogs. The homes below are active in the market and supports my statements. Obviously a clear understanding of marketing strategies that you can find on public websites. Author danswingblogPosted on December 19, 2018 December 19, 2018 Leave a comment on Please review Supportive data for this brief. They are the home buyers who reach a home purchase agreement relatively easily without much back-and-forth negotiation. The purchase agreement is signed. Then the “NIBBLING begins! A very smart and common practice “NIBBLING” negotiation tactic for home buyers is to include their approval of a professional home inspection report contingency in the sales contract. BEWARE…An “AS IS” FARBAR purchase agreement is best described as a favorable agreement for the BUYER! Not the seller, as perceived by a seller or his agent! Why you ask? We’ll get into this matter later on. Today, most experienced Realtors strongly encourage buyers to make their purchases contingent on approval of a professional home inspection paid for by the buyer! Now moving forward, an inspection has been performed and the report reveals significant home defects that the seller “FORGOT” to disclose to the buyer, the buyer can then use that report to (A) renegotiate the sales price, (B) obtain a repair credit, or (C) cancel the sale. To counteract this tactic, home sellers and their listing agents should set a quick deadline for the professional inspection report, such as 5, 10, or in most common practices 15 days. It’s important not to keep the property off the market long. If the home passes the professional home inspection test, watch out for other tactics of non-stop negotiators. One of their favorite methods is to repeatedly come back to the home, even after the sales contract is signed by all parties. They use excuses such as, “We need to measure for our furniture.” A reasonable request! But their true purpose is another visit to the home to look for defects and leverage a lower sales price or even cancel the sale! Especially if the buyer has a serious case of “buyer’s remorse.” Ugh…this happens more often than you would imagine. except for the customary inspection on the day before the closing of the home sale! The buyers entered into a purchase agreement and it is best that a serious escrow deposit is made. This is also considered a “Good-Faith” gesture to the seller, indicating the buyer is serious about buying the home. These funds “Cannot” be moved or touched without written consent from Both the buyer and seller! I must say, “in the past week I’ve received plenty of compliments from buyers, sellers, and agents and have shown a real interest in my blog material. Most of what I’m sharing is from recent data collected, the National Association of Realtors shares to agents, and my personal experiences. What home buyers, sellers and realty agents are likely to encounter. According to recent information from the National Association of Realtors, the National Association of Home Builders, and other reliable sources, the volume of home sales has declined slightly in the last few months compared to a year ago. You may hear many say the traffic has really slowed, or inventory is down! Factors that are affecting this; The Bull Market has many on edge. Mortgage rates are increasing, however, I’ve found that with an experienced agent and some creative tactics and knowledge will definitely make deals happen! An excellent relationship with one’s mortgage broker is always a plus. Non the less, the holidays will also slow the market traffic, and you will notice more lookers, and fewer folks willing to pull the trigger. As the home sales market adjusts to slightly higher mortgage interest rates, and you’re a home buyer, seller, or real estate agent, your negotiation skills will become more important now than any time in recent years. As a long-time student of negotiation tactics, I’ve learned it pays to periodically review the key negotiation strategies most frequently encountered in home sales. Experienced real estate agents can spot this negotiation tactic, which is used by new and repeat homebuyers. I first encountered it about 18 years ago from a young couple who were my tenants. They wanted to buy the house I was renting to them. The husband’s father was a lawyer and a friend of mine. This should have been my first warning however, I was confident we were on the same page. Once we all agreed on the terms and a price, I wrote up the contract, the wife then said, I would like my father in law who is helping with the purchase review the contract. Note buyers purchasing an “AS IS” contract can bolt without reason within the first 15 days or inspection time agreed upon in the contract. Well even though a friend, I just became a victim of the “Higher authority negotiator” tactic. This means the salees contract you think you have negotiated is subject to approval by a previously undisclosed higher authority. When dad visited the home, and I know he was familiar with the home, he found alleged defects such as it was not a split bedroom plan, which he brought to their attention. He also pointed out the con’s of the location even though they’ve lived there over a year. So my buyers asked for a price reduction and revisited the terms we had already agreed upon. Well, I was too confident in the deal and the next thing I knew the “higher authority” negotiation tactic, also known as “two bites from the apple,” I knew the value of the property and didn’t really want to sell. My tenants were happy there and more than likely would stay at least another year. My good friend and their “higher Authority” did not know I was not motivated to sell. I was clear, honest, fair and shared that we reached an agreement on favorable terms to both of us. the buyers had been renting the home and knew it’s pros and cons, and if my tenants didn’t want to buy the house on the agreed terms that were fine with me. Well, they still purchased the home on the original agreed terms and dad put up the $45,000 down payment. Looking back, if I had known there was to be a “Higher Authority” involved in the negotiation, I would have suggested we all meet together to work out the details at the same time. NEXT BEWARE OF NON-STOP NEGOTIATORS WHO NEVER QUIT “FINDING REASONS TO BEAT YOU DOWN!” We’ll visit this tomorrow.